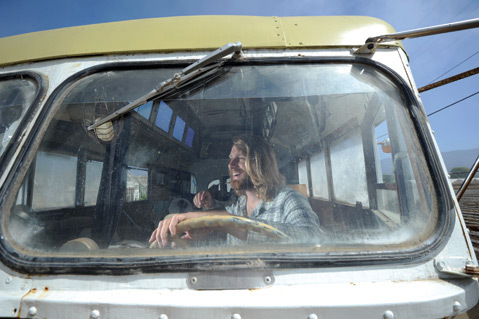 Ryan Lovelace in the bus he's working on. Specifically, Almost Cut My Hair showcases the surf-sliding talents of the 805’s most groovy young lions of style, people like Trevor Gordon, Travers Adler, Troy Mothershead, and Simon Murdoch, alongside decidedly less local but equally groovy wave riders like Ryan Burch, Cyrus Sutton, and Ari Browne. 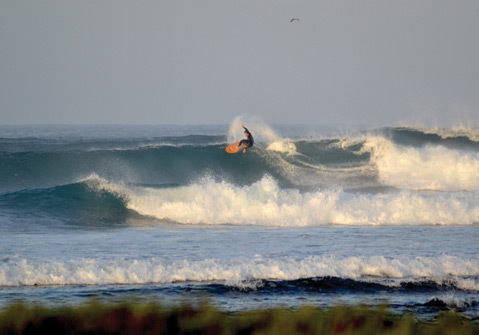 And, while familiar haunts like Rincon and Sandspit get the bulk of the on-screen coverage, the footage, much of it shot by über-talented surf documenter Mike Kew, is of Lovelace-influenced surf action from spots all over the world, including India, Bali, Mexico, and Australia. Add to this a soundtrack comprising musicians like Johnny McCann and Landon Smith, all of whom are personally connected to Lovelace (and many of whom actually ride his boards), and you get a film that is essentially a zero-budget, homemade affair. In other words, Almost Cut My Hair is as much about “good, clean surfing” as it is about Ryan Lovelace’s own handcrafted, Santa Barbara–centered universe and all the wonderfully skilled people who inhabit it. Almost Cut My Hair premieres this Sunday, May 26, at 7 p.m. at the Marjorie Luke Theatre (721 E. Cota St.) with live music from the soundtrack. Tickets are available at the door for $2. For more info, visit rlovelace.com.